There are many tutorial available about how to add Facebook Like Box. 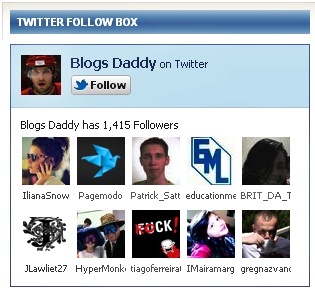 But Today in this useful post I will simplify the tutorial "How to Add Twitter Follow Box In Blogger or Wordpress Blog?". In Facebook like box you see "Like" button but in Twitter follow box you will see "Follow" button. As you can see in the image below this is what your box will look like when you will apply the code in your blogger or wordpress blogs. Let's start working now. Copy and Paste Above Code Into That Gadget and Replace BlogsDaddy With Your Twitter Username and Click On Save.